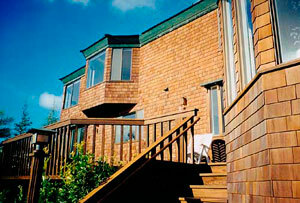 Paint Pro Magazine Article: Exterior Wood Stain: Staining Shingles & Shakes. 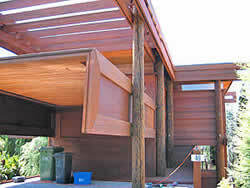 Modern exterior stains can preserve the beauty of cedar, redwood, and cypress for many years. 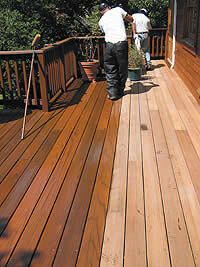 PaintPro Magazine Article: Wood Finishing: Clear Wood Finishes. Should clear wood finishes should be used on exterior wood siding or decks, because few clear finishes offer ultraviolet (UV) protection? he could rock climbing and otherwise goofing off. When cash ran low, the 22-year-old rock hound started working for a painting-contractor friend. For seven summers, on and off, Robles worked on the area’s high-end redwood and cedar homes, learning the ins and outs of wood restoration along the way. Ready for a change in 1994, Robles moved to Marin County in Northern California. There he found that fine wood homes are at least as common as they are in Tahoe. And plenty of them are perched on steep hillsides — perfect for a wood restorer adept with a climbing harness and belay device. 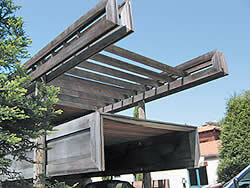 Robles also found that none of the area’s painting contractors specialized primarily in wood care. “I looked through the Yellow Pages and noticed that it was always painting-slash-wood restoration — not the other way around,” Robles says. So Robles got his contractor’s license and turned the painting/wood restoration equation on its head, opening Marin Wood Restoration & Painting with co-founder Paul Burrous. In 2003, he went solo and opened Norcal Wood Restoration & Painting. He specializes in restoring wooden siding and decks for high-end homeowners, property management companies and homeowners associations in a market that includes the San Francisco Bay area. Robles realized early on that he could distance himself from the pack by increasing his understanding of wood and wood restoration. So he embarked on a self-directed crash course in the subject. When meeting prospective clients, Robles often relates wood care to skin care, an analogy his California clientele can identify with. Another way Robles separates himself from the pack is by continually experimenting with new products. That’s how he come to adopt The Flood Company’s Clear Tannin Guard, which prevents those tea-colored tannin stains caused by bleeding redwood and cedar. TWP’s Mildew Sealer is another new product he’s adopted. For staining the oldest, most weather-beaten wood, Robles uses TWP stains because they contain up to 95 percent solids, which helps hide worn-out wooden substrates without completely obscuring the grain. As a rule of thumb, the older the wood is, the less translucent the stain should be, he says. For newer wood, Robles relies primarily upon Armstrong-Clark’s line of transparent and semi-transparent stains, an old-fashioned linseed oil-based formula with transparent oxide pigment that provides sun protection. The Armstrong-Clark line is now available with a flame-retardant additive designed to last the life of the stain. It’s a feature Robles used in selling a job to a Bay Area homeowner who had rebuilt his house after the original was destroyed in the firestorm that swept through the Oakland-Berkeley Hills in 1991. For solid finishes, Robles goes with The Flood Company’s Solid Color Finish, which adheres to a wide range of problem surfaces due to the Emulsa Bond it contains. Robles credits the Emulsa Bond-rich stain with helping him win a bid to refinish a 75-unit condominium complex with blackened, severely weathered siding — even though his price was some $30,000 higher than anyone else’s. The solid stain’s 15-year guarantee on siding helped him win the job, he says. “I was the most expensive, but I was using a higher-end product, and it was easy for the customer to figure out that to spend a little more money now they’d have something that would hold up and look better over the years,” he says. Decks, siding and other wood restoration jobs make up about 60 percent of his work, and almost all of his customers are good for repeat business. This article © 2005-2007 Professional Trade Publications. Used by permission.